Sponsored by the Mathematics Research Institute, The Ohio State University, Columbus, the Center of Ring Theory and its Applications, Ohio University, Athens, and The Ohio State University at Lima, Lima. 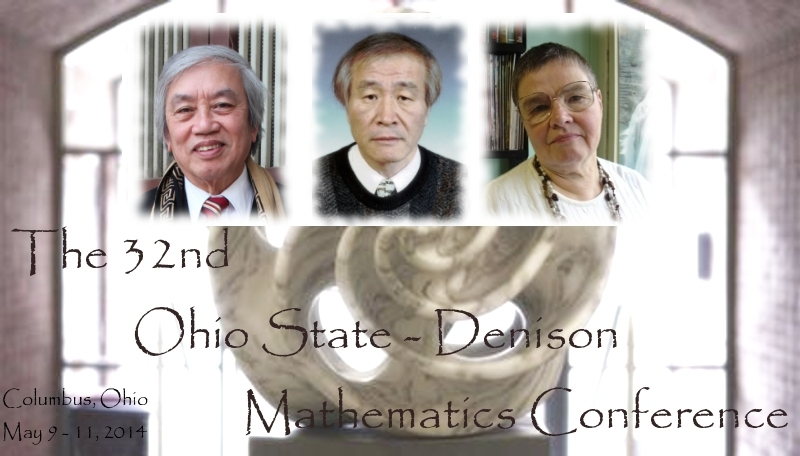 The 32nd Ohio State-Denison Mathematics Conference will be held from Friday, May 9 through Sunday, May 11, 2014 at The Ohio State University, Columbus, Ohio. It will have sessions on Group Theory and Ring Theory. The conference was initiated by Professor Hans Zassenhaus in the early 60s and has a long tradition. The Group Theory Session will be dedicated to Professor Luise-Charlotte Kappe (Binghamton University). The Ring Theory Session will be dedicated to Professor Dinh Van Huynh (Ohio University, Athens) and Professor Jae Keol Park (Pusan National University, Busan, South Korea). The deadline for abstract submission and free registration is April 25, 2014.The website will accept abstracts in TeX/LateX. Detailed program and submitted abstracts will be available online before the conference starts. Let the organizers of your session know if you have any specific needs for your talk. Unfortunately, no funding is available to support conference participation. We will post further information on this webpage as it becomes available. We look forward to seeing you at the conference. Copyright © 2014 Cosmin Roman. Design by Andreas Viklund.